VATICAN CITY, Rome -- For all the dramatic differences between Pope Francis and Donald Trump, there is one area where they are similar. Both are reluctant to condemn Russia for its actions in Syria and Ukraine. Pope Francis stands next to Russian Orthodox Patriarch Kirill of Moscow after the two leaders signed a joint declaration during a meeting at Jose Marti International Airport in Havana Feb. 12, 2016. President Trump's positive views of Russian President Vladimir Putin have been the subject of much media attention, and their underlying motivation will be the subject of congressional investigation in the coming months. But why is Francis so reluctant to speak out? Although he is usually careful when he speaks on international issues, Francis is not reluctant to condemn the arms trade, the use of armed force in settling disputes, and the inhospitable treatment of refugees and migrants. He has also spoken out about the need to deal with climate change and supported the Paris climate accord. He has even expressed fears about growing populist nationalism in Europe. Most notably, he got into a personal argument with Trump on immigration. While the Vatican does not often condemn specific countries or leaders, when it comes to Syria and Ukraine, the Vatican has been especially reticent. It calls for an end to fighting without condemning any side in the conflicts. For example, Francis condemns the "unacceptable carnage" that is taking place in Syria without pointing any fingers. It is not that Francis is reluctant to say anything about Syria. Early in his papacy, he called for a world day of prayer and fasting for peace in Syria. This September 7, 2013, event was clearly aimed at stopping President Barack Obama's plan to bomb Syria in response to Bashar al-Assad's crossing the president's red line by using chemical weapons against his own people. Obama decided against the use of force and successfully negotiated with Syria and Russia an agreement to eliminate Syria's chemical weapons stockpile. When this year Assad again used chemical weapons against his people, Trump retaliated with an air strike against the air base whose planes used the banned weapons. The pope and the Vatican have repeatedly called for international diplomacy in support of a cease fire and ultimately an end to the war in Syria. The Vatican has urged that humanitarian assistance be given to Syrian refugees and to those still trapped in war zones. It is also very concerned about the fate of Syrian Christians if the Assad regime falls. The relative silence on the 2014 invasion of Ukraine is even more remarkable, where Russia has been almost universally seen as the aggressor. The United States, Britain, France and Eastern European countries pressed the Vatican to condemn the Russian invasion of Crimea. The Lithuanians, Estonians and Poles were especially concerned, but it did not happen. Meanwhile, Aleksandr Avdeyev, the Russian ambassador to the Holy See, who was from Ukraine, was lobbying not only for his government but also for the patriarch of Moscow. The Russian ambassador even spent a lot of time talking to Italian bishops. 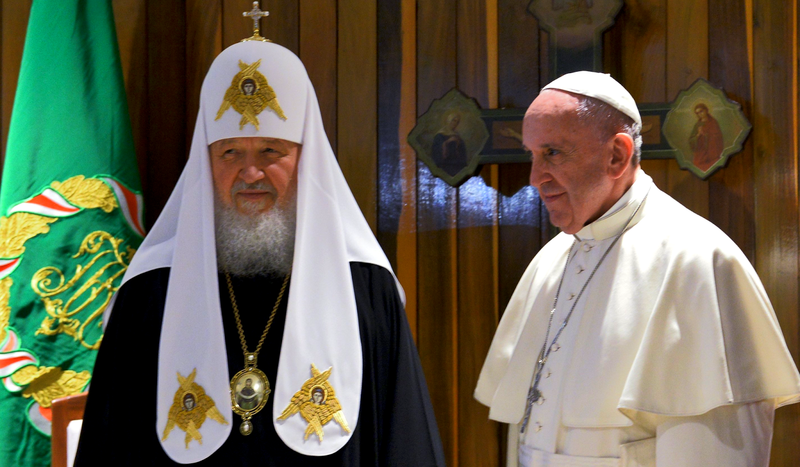 Concern about endangering relations with the Russian patriarch swayed the Vatican foreign policy on Syria and Ukraine. "The pope didn't want to upset Patriarch Kirill," explains Ken Hackett, U.S. ambassador to the Holy See from 2013 to the end of the Obama administration. "He wanted to move towards a closer dialogue with the Russian Orthodox, and he was afraid that if he condemned the Russians in this action, it was going to close the door." The Vatican worried not only about the patriarch but also about Putin, because he could also kill any attempt to improve relations between the two churches. "We all kept pushing until finally [Vatican Secretary of State Pietro] Parolin took a trip up to Lithuania, Latvia and Estonia," reports Hackett. "While he was out looking at something, the Russian planes buzzed over, flew right over the Lithuanian territory. ‘Aha, okay, now I get it,' Parolin said." What ultimately did the pope say? "First, he called for a humanitarian response to the needs, so there was a recognition that the needs were really bad," answers Hackett. "Second, there was a much stronger statement about protecting the integrity of the country. But they never condemned the takeover of Crimea." The response of the Vatican to Russian activity in Syria has been muted for the same reasons. But not alienating the Moscow patriarch is not the only reason for the Vatican not condemning Russia. The Vatican also hopes that it can play a mediating role in both disputes, which would be impossible if it was seen as siding with one party to the dispute. In addition, when it comes to Syria, the Vatican reflects the concerns of Syrian Christians about what would happen to them if the rebels brought Assad down. Some kind of negotiated settlement would be the best for the Christians, and the Vatican is pragmatic enough to understand that a peaceful resolution of the conflict will have to involve the support of Russia, where Putin presents himself to his people as the defender of Orthodox Christians in the Middle East. Has this strategy proved successful for the Vatican? The Vatican position did not please the Obama administration or Western European governments. It certainly has not pleased Ukrainians and other Eastern Europeans who worry about Russia. Catholics in these countries wish the pope would be more condemnatory toward Russia. They undoubtedly long for the days of John Paul II rather than Francis, who might remind them of Paul VI's Ostpolitik (Vatican efforts to engage with Communist countries). On the other hand, it has proven to be a successful strategy for dealing with the Russian Orthodox Church. For the first time in history, a pope met with the Russian patriarch in 2016. The meeting, which took place in Cuba, had been sought by the last two popes without success. Was this meeting a reward from Putin to Francis for his tempered response on Syria and Ukraine? Perhaps. There is no question that Putin supported the meeting of the patriarch and the pope, otherwise it would never have happened. If the Vatican had been aggressively hostile to Russian actions in Syria and Ukraine, this meeting would have never taken place. The joint statement that came out of the meeting between Francis and Kirill was carefully crafted. It did not call the Russian actions an invasion (the position of the West) nor did it refer to the conflict as a civil war (the position of Russia). Rather it said: We deplore the hostility in Ukraine that has already caused many victims, inflicted innumerable wounds on peaceful inhabitants and thrown society into a deep economic and humanitarian crisis. We invite all the parts involved in the conflict to prudence, to social solidarity and to action aimed at constructing peace. We invite our Churches in Ukraine to work towards social harmony, to refrain from taking part in the confrontation, and to not support any further development of the conflict. For both Syria and Iraq, the pope and the patriarch jointly urged "the international community to seek an end to the violence and terrorism and, at the same time, to contribute through dialogue to a swift return to civil peace." The meeting with the patriarch was a big win for Francis. It raised dialogue between the Catholic Church and the largest Orthodox church to a new level. Every pope since Vatican II has desired such a meeting, but Russian patriarchs have objected for one reason or other in the past. In the joint declaration, both parties say, "We are pained by the loss of unity," and speak of their "determination to undertake all that is necessary to overcome the historical divergences we have inherited." Because of this meeting, it will be much easier to arrange future meetings. For the future of ecumenical relations between Catholics and Orthodox, this is very important. The situation of the Eastern or Greek Catholic Churches was also clarified in the joint statement. These churches are in union with Rome but have married clergy and liturgies and traditions similar to the Orthodox. Orthodox leaders, including the Moscow patriarch, are unhappy with the existence of these churches, which they accuse of proselytizing among the Orthodox. The pastoral activity of these churches has been one of the reasons the Russian patriarchs have refused to meet with popes in the past. After Vatican II, the Catholic Church recognized that unity with the Orthodox would come through dialogue, not through the conversion of individuals or communities of believers from the Orthodox to the Eastern Catholic churches. That is clearly affirmed in the joint declaration, which pleases the Orthodox. "It is today clear that the past method of 'uniatism,' understood as the union of one community to the other, separating it from its Church, is not the way to re-establish unity." But equally important to the Vatican and to Greek Catholics is the acknowledgement by the patriarch of the right of these churches "to exist and to undertake all that is necessary to meet the spiritual needs of their faithful." This statement is taken almost word for word from the 1993 Balamand Statement of the international dialogue, so it seems to represent a Russian Orthodox acceptance of the thrust of that text. The two leaders expressed the "hope that our meeting may also contribute to reconciliation wherever tensions exist between Greek Catholics and Orthodox." It also laid out numerous ways that Orthodox and Catholics can work together for the good of humanity. If relations between Rome and Moscow continue to improve, then the Vatican strategy has been a success. It appears to be an example of the Vatican thinking in centuries rather than responding to immediate events. But don't expect a quick and easy path to reunion. As noted last week, only 17 percent of the Russian Orthodox faithful have any interest in communion with Rome. While the Vatican strategy has been good for Catholic-Orthodox relations, has it been successful otherwise? The Vatican has not become a mediator in either Ukrainian or Syrian disputes. But the Vatican position is not so out of line with U.S. policy now that the Trump administration is making nice with Russia. Will Trump and Putin see the pope as an ally for their attempts to solve these conflicts just as the Obama administration saw Francis as an ally in its rapprochement with Cuba? Anything is possible with these leaders.